Members of the Westport police union outside headquarters on May 21. WESTPORT — The men’s and women’s locker rooms and bathrooms at police headquarters are getting an upgrade, thanks to a $200,000 anonymous donation to the department. The Representative Town meeting also approved an appropriation of $36,000 for the project at its meeting Tuesday. “The reason we’ve reached a level of the condition that the locker rooms are in — and they’re truly deplorable — is we were told the police department at some point may move, and we were very careful with how much money to invest in the police department. As we’ve seen there’s really not a lot of available space nor the funding to spend $150 million on a public safety complex, so slowly over the last three years we have started renovating the police department,” Westport Police Chief Foti Koskinas told the RTM in his presentation asking for an appropriation for the remodeling project at the department’s 50 Jesup Road headquarters. The project’s cost will be partly paid for by an anonymous donation of $200,000 to the Westport Police Department. 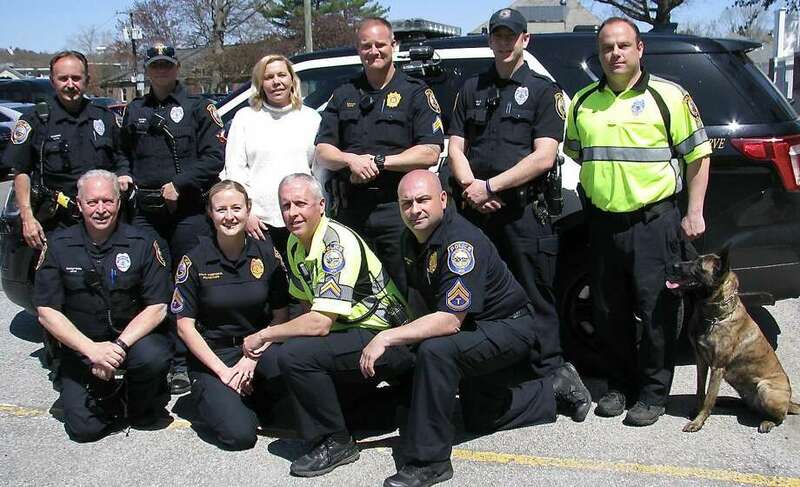 “This is a longtime supporter of the Westport Police Department. I don’t take credit for building this relationship, but I will take some credit for maintaining the relationship. And when this person heard the condition the locker rooms were in and physically came and saw them, this person was more than willing to make his very generous donation,” Koskinas said. Three years ago, Koskinas began asking for appropriations for infrastructure improvements at police headquarters, including replacements to the roof and heating and cooling system. The locker room and bathrooms are in particular need of renovation because they were built in 1980, when the police force had one female officer. However, in recent years, the department has had as many as 14 female officers on duty at one point, and the small women’s locker room was not meant to fit that many female employees, Koskinas said. Additionally, while officers in the 1980s needed space to store a revolver, baton and winter gear, if necessary, officers now need room for multiple electronic devices, such as stun guns, cellphones and portable radios, in addition to bulkier items like bulletproof vests, which the department’s current lockers cannot fit, Koskinas said. Koskinas said he attended trade shows and talked with area departments, including the Darien and Norwalk departments, to choose a local vendor for the locker rooms. While 29 RTM members voted in favor of the appropriation and to accept the donation, RTM member Kristan Hamlin abstained from the vote, saying Koskinas did not complete a competitive bidding process for the new locker rooms. “It’s not the way government ethics is supposed to work. You have to have an arm’s length and competitive bid. And just because the Darien police did it, doesn’t mean you don’t have to go through the process,” Hamlin said. Koskinas countered that other aspects of the renovation process, such as the plumbing, electricity, and heating and cooling work, will all go through a competitive bidding process. He said the department chose to forgo a competitive bidding process for the lockers because they didn’t know if they could find the supplies they wanted from another vendor, and received good feedback from other area departments who used the same vendor. The RTM will meet July 10.